“User experience is everything. It always has been, but it’s undervalued and underinvested in. If you don’t know user-centered design, study it. Hire people who know it”. User Centered Design is the industry and ISO standard methodology for creating outstanding usability and user experience. It involves three primary activities: 1) Field studies- analyzing user needs and desires; 2) Interaction Design: Rapid wireframe prototyping of potential solutions and 3) User Testing your designs with users to gain design feedback. User-centered design (UCD) is an iterative methodology for creating great user experience. It is also employed to accomplish the activities that make up the new innovation technique called Design Thinking. The international standards organization specifies Human-centered design for interactive systems in ISO standard 9241-210. UCD is about changing how software development is done. How? You involve users early on in your requirements specification and throughout design and development. This helps you avoid failure caused by assuming you know what users want! Organizing screens around how users think also helps your avoid the known problems inherent in making users follow designer intuitions, or developer rules. Finally testing to see if designs make sense to users, and if users can perceive and locate key interface controls, can help you mitigate poor quality or lost business. Agile or Lean UX teams use UCD as a grounding mechanism to deliver good user experience. UCD ultimately is about changing your organizational culture from Inside-Out to Outside-In. This means you approach UX design, development and business decisions from the user’s perspective, needs and behaviors-- not your companies. Avoid poorly designed interfaces and worse, poorly executed UX design efforts. Optimize for end-user needs, goals and desires. Gain insights needed to put users at the center of the user experience. Enjoy the ROI gained on reducing development time and improving efficiency. Field Studies, Ethnographies, Interaction Design, Information Architecture, UI Design, Emotion Design, Usability Testing, Eyetracking. User Centered Design is where great UX is born because it involves users along the entire software development journey. Companies who focus on user experience outperform their peers with 3X the return on investment. Studies show User Centered Design yields high Return on Investment. It’s linked to: Call to action and conversion rate increases; Landing page conversion; Content engagement, Customer acquisition and retention; Customer satisfaction; Loyalty and Word-of-mouth marketing. User Centered Design is a methodology, which means you ideally are doing all aspects of UCD including not just wireframe prototypes but user research, and user testing. Any aspect of the product lifecycle. Field studies are performed in a cycle zero, gaining directional feedback before the sprint cycles begin. Wireframing occurs at the start of the first 2-3 sprints. 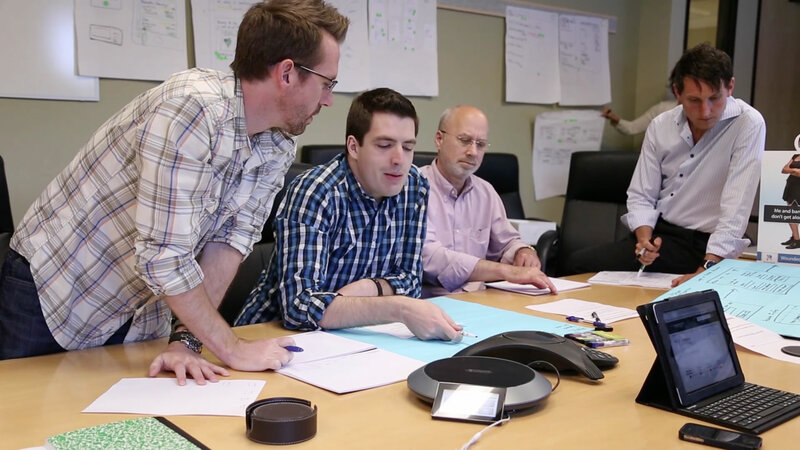 Usability testing occurs toward the end of the sprint (on new or redesign projects) or up-front (if used to understand where a current product stands).